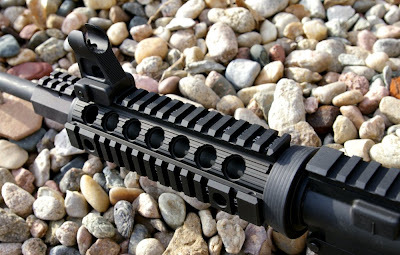 Like many I found myself having the need to attach a few options to my AR and extend my top rail for simpler optics mounting. In this case, the hand guard broke on DPMS Oracle kit. 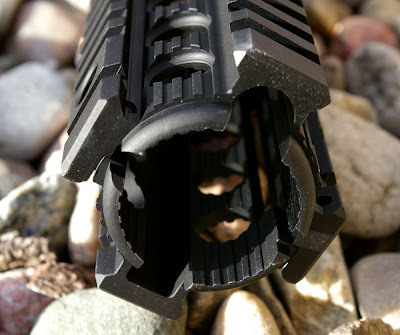 The Oracle kit has been featured in a number of previous articles and honestly the gun gets the hell beat out of it on a regular basis. Apparently it cracked one of the 100 times I slammed it against a support. 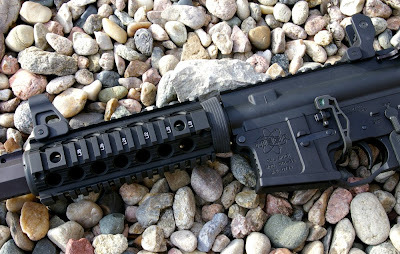 Although not a big deal, the last thing I wanted to do thought was pull off the gas block and remove the flash hider just to mount another handguard. 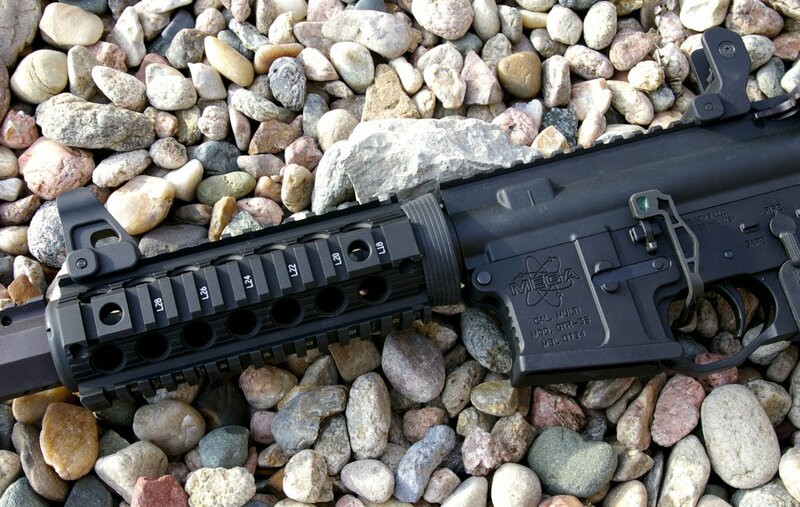 Troy Industries has been the leader in hard use aftermarket AR accessories for some time and has a solution with their Troy Drop In Quad Rail. 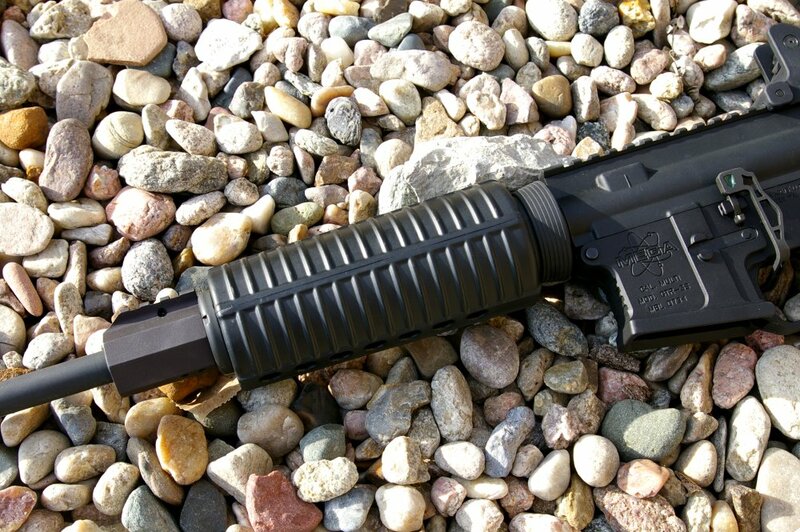 The Troy Drop In Quad Rail allows you to replace your plastic hand guard with a rock solid optics stable quad rail in about 2 minutes all without removing your front gas block/sight and muzzle brake. Troy’s Drop In Rail is a simple professional strength non-free floating direct replacement for all M4//M16/AR15 carbine length plastic hand guards. On the box Troy states it takes about two minutes and they were right on the mark. Replacement was as simple as disassembling the Troy Drop In Quad Rail via four screws, removing the old hand guard, popping the Troy quad rail on, and screwing it back tight via the four screws. 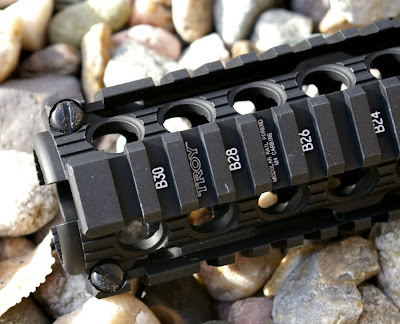 The fit is exceptional and rock solid thanks to Troy’s patented clamping system. I expected a minute amount of wiggle, but the Troy Drop In Quad Rail is absolutely rock solid zero play platform to mount everything from optics to lasers and lights to. 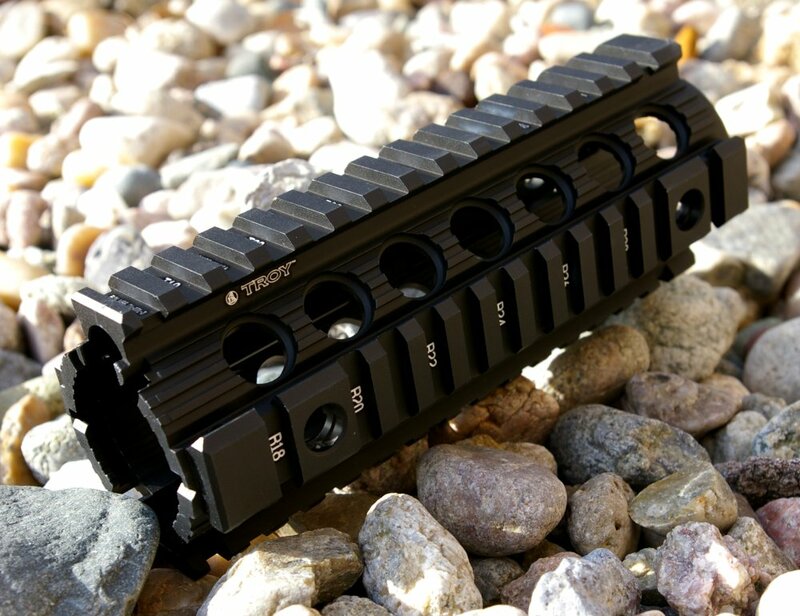 In addition to easy and quick mounting, the Troy Drop In Quad Rail provides the user all the standard features we have come to expect from Troy’s free-floating quad-rails including 1913 standard picatinny rails, full T-markings, and of course Troy's T6061 hardened aircraft aluminum and finished in MIL-STD Type III Hard Coat Anodizing available in Flat Black or USSOCOM Flat Dark Earth. 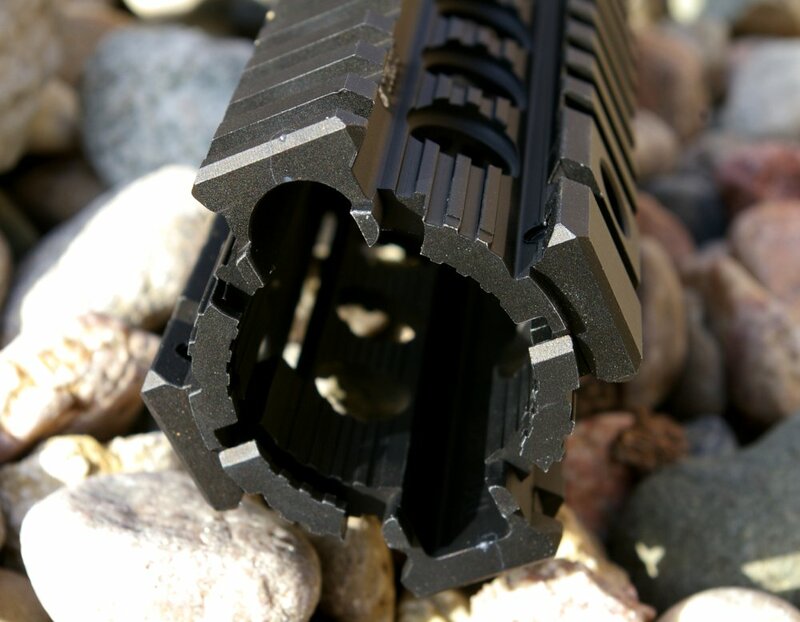 Unlike a lot of the “me to” brands that have come along, Troy Industries still makes all their products right here in the USA. Also added during the upgrade were front and rear Troy fixed BattleSights because this rifle is used 99.9% of the time for shorter range drills and I felt deprived not having a good set of fixed iron sights. 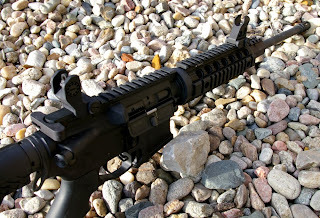 Now that I had a rock solid rail platform that continues from the upper receiver through the front of the handguard, the occasional 1-4X scope mounting becomes simply mounting one scope ring on the receiver and the other on the forend instead of using one of those scope cantilever scope mounts. 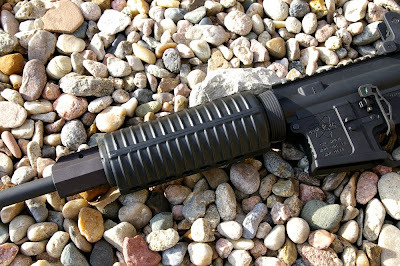 For those with standard plastic handguards this is a simple upgrade that provides free-float functionality with only a flat-head screwdriver. You will obviously not get the accuracy improvements of a free-float tube, however you will get all the other benefits of a solid optics mountable quad rail without having move, remove, un-pin, or unscrew anything other than your stock hand guard. 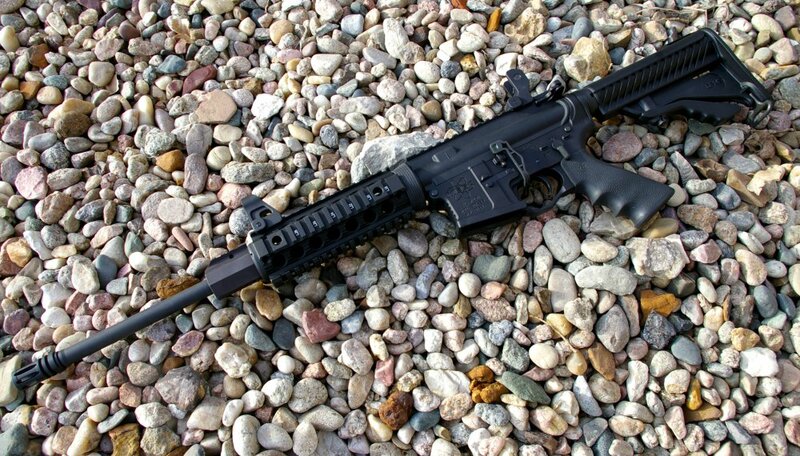 For $150 this is a great buy and AR upgrade. Sizes - Carbine, Mid-Length, Rifle Length.